I wanted to write this testimonial to Dr. Choi. I’m 56 years old and I had severe sciatic pain for several years. On March 5, 2012 Dr. Choi performed my back surgery fusing my L4/5 – S-1 disks. It has been over one year since my surgery and I feel great with no pain. I’m able to walk, exercise, and play golf again pain free. If you are considering back surgery, I highly recommend that you consult with Dr. Choi and his staff. Thank you Dr. Choi! Dr. Choi. Once again you have worked your “magic”. The day after surgery I passed my occupational therapy both walking and stair stepping. The fact I was in and out in 48 hours speaks volumes to your surgical skills. After being at home for several days, I was outside walking and within a few days up to one mile and now 1.5 to 2 miles. As with the earlier surgeries, I’ve experienced no “surgical site” pain or discomfort. My scar already looks just like another wrinkle on my neck. You are an amazing man and I still think you “walk on water” when using your skills. Especially on a tough case like me. With heart (and body) felt thanks! Dear Dr. Choi, I would like to express my thanks and appreciation for your excellent work on my lower back condition, which is enabling me to achieve a progressive return to action during my recovery period. Almost immediately, I woke up following the surgery, I realized that my nine months of extreme discomfort had vanished. This was a terrific results for me and I am very grateful to you and your wonderful skills. Best regards and many thanks! Dr. Choi, I just wanted to thank you for our successful surgeries in late September. I am healing up well! Haven’t felt this good in several years. I think I got it right this time! I appreciate all of your efforts and dedication to your profession. We need more like you. Anyway, just a note of appreciation! We’ll see you soon. Hopefully I won’t if I continue to progress like I am. Sincerely, Dale. Dear Dr. Choi, I am so grateful the good Lord put me with you. Wow your reputation of excellence is certainly impressive, your character, your integrity, your humility and your kindness won me over. Dearest Dr. Choi, Thank you for saving me. Hugs and Kisses. Dr. Choi, I am feeling great and getting a lot of my flexibility back. Hope you and your family have a wonderful year! Dr. Choi, I just wanted you to know how much I appreciate everything you have done for me. I am feeling better already, although I just found out I will have surgery on my wrist next week. Thank you again, you are a true professional. Dr. Choi performed anterior cervical surgery fusing three vertebrae. Pre-op and post-op treatment by Dr. Choi and the staff were exemplary Numerous times during my hospitalization, hospital personnel commented upon the fine abilities of Dr. Choi in treating his patients and having successful surgical results. Following a continuing physical therapy flexibility and strengthening program, my neck has a wide range of motion with no discomfort. We recently celebrated our 50th wedding anniversary and guests who knew about my surgery were pleasantly surprised to see my ‘normal’ physical condition; those who didn’t know about the surgery, just considered me my old self. My pre-op conditions of tingling fingers and numbness have been eliminated. Unseen and unfelt serious conditions in my neck have been corrected. I look forward to resuming our full active life-style of gardening, hiking, biking, and skiing (albeit, in a controlled manner, befitting our ages!). Thank you Dr. Choi and staff. Dear Dr. Choi and staff, I wanted to thank you for your excellent care in your treatment at the office and at the hospital. Your patience with me and all my questions and phone calls are greatly appreciated. Your compassion, kindness and caring manners mean so much to me. If I could buy you the moon I would. Sincerely. Dr. Choi, I just had to thank you very much for being such a great surgeon. When I heard you were the best, I feel so blessed that you were referred to me by my doctor. Thank you for all you have done by fixing my neck and being so patient to listen to my concerns. Thank you also for all that you do. Dr. Choi, thank you very much for taking such good care of me before, during, and after my surgery. I appreciate your skill and kindness. Dr. Choi Thank you all so much for your kindness and being there for all my silly questions and needs. Everyone has spoken so highly of you all and I certainly know why! Dr. Choi & Precision Spine Thank you, thank you, thank you! You are all so wonderful! Thanks for making a serious situation so easy! Dear Dr. Choi Just as my card says, I seriously cannot thank you enough. You are an amazing person and myself and my family are all so grateful to have had you work on us. I feel pretty great and I’m excited to start a new life soon. Thanks again! Dr. Choi Thank you so very much for the care that you’ve given me, and the excellent job you did on my surgery! I hope my gift to you conveys my appreciation, and that it shows my respect and honor for your talents. God has blessed you richly- that you are able to help so many people. You have given me my life back and for that I am deeply grateful. I will pray for you always! My journey began in 2000, with a microdiskectomy at C6-7. I regained only about 65% use and mobility of my left arm, and lived with increasing pain and paralysis for ten years. On 6 October 2010, Dr. Choi and his team performed an anterior cervical disc fusion at C5-6 and C6-7, with application of the Stryker anterior cervical plate and allograft. Upon awakening from surgery, the radiculopathy I had endured for many years was gone. Physical therapy and exercise followed, and I received a complete release to resume all normal activities on 20 December 2010. I have returned to a full and active existence, and have been skiing fifty times this winter. I am a 63 year old retiree, living the outdoor life style in Northwest Colorado. I cannot find sufficient words to express my gratitude to this wonderful surgeon and empathetic gentleman, his outstanding staff, and the fine folks at Sky Ridge Medical Center. Thank you, Dr. William Choi, for giving me back my life. Dear Dr. Choi and staff: It has been over three months since you performed the spinal fusion surgery on my back. I am feeling very well as time goes by. I appreciate all you have done for me and my back problem. The surgery was great and the help I received from your office staff Megan, Nicole, and Sarah when I called with questions of various things related to the surgery (including rapid refills on my pain medications). I am off the pain medications now and appreciate the friendliness and positive interaction with all of you. The exercises that Mike Miller gave me I am still doing along with the exercises from my PT for the core muscle exercise program. I would have no hesitation in recommending your services to others who may have need of them. Thank you so much. It’s early on, only 2 weeks post surgery for a fusion of L4/5 – S/1. My back had it all, scarring, arthritis, curvature, twisting, bulging disks, compressed disks and compressed nerves – you name it. My pain was mainly sciatic in one leg, constant when standing and in the range of 8-9. I live an active lifestyle and just endured the pain until it would take my breath away. Now it’s two weeks since I’ve had that pain and I can’t believe it. Dr. Choi’s confidence and sterling ability has given me freedom to live and play without the torment of my strangled spinal nerves. I stand and walk for hours without any traces of my now corrected issues. I’m still 4 weeks from my checkup and X-Ray, but I’m pretty sure it’s only going to get even better. Thank you, Dr. Choi. I had L4/L5 fused 30 years ago and in the last couple of years the disc above and one below started to bulge and created numbing and lose of feeling in my legs, my back was in pain again. I could not walk without a cane or holding on to the wall very slowly. Dr Choi fused levels L2,L3,L4,L5 and S1, I walked out of the hospital with all my feeling in my legs and my pain in my back was gone. I recovered quickly, never using a walker or a cane. I am now starting P/T. I thank Dr Choi for giving me my life back. I am so grateful to him and his wonderful staff. Neurosurgery Associates mission statement includes Neurosurgery Associates is committed to excellence by pledging to provide the highest quality of neurosurgical care possible. Along with the treatment of immediate or chronic problems, we strive to integrate the doctrine of prevention in all our treatment plans as a way to alleviate possible future difficulties. The care that I received from Dr. Choi and his exceptional staff was exemplary and meets the guidelines set out in their mission statement. I have had chronic back pain for the past ten years. The pain graduated to the point where I could barely move in my day-to-day activities and it really impacted my life. In September 2010, Dr. Choi performed an L4 L5 Decompression and Fusion. Immediately after the surgery I knew he had resolved this long term problem for me. I have no pain in my lower back. There is no tingling in my leg and I am easily able to travel and perform my job. I also need to commend the surgery and nursing staff at Sky Ridge. I had the best care start to finish. My wife (and I) believes that Dr. Choi gave us my life back. Thank you Doctor Choi and staff! You truly improved the quality of my life. Mike H.
Dr. Choi performed a re-fusion of my L5-S1 level in my lower back April 7,2010. My first fusion of this same level was done in 2002 in Tulsa, Ok. I had been to doctor after doctor in an attempt to find out why I conintued to have pain. I required strong pain medication on a routine basis for five long years and had begun to feel this is how I would have to live out my life. We came to Colorado three years ago and the Primary Physician we had chosen is the one who recommended I see Dr William Choi just to see if he could help me. He was very compassionate, understanding, and honest with me. He performed my re-fusion in April. I had known back pain, pain down both legs, and numbness in my feet for five years. The moment I woke up from the surgery I realized I had absolutely NO leg pain! The only pain I had was post-op surgical pain. I spent less than 48 hours in the hospital post-operatively and my recovery has been great! There is no doubt in my mind (and my wifes’ mind) that God directed us to Dr. Choi. We would both HIGHLY recommend Dr. Choi to anyone we know. We trust him and thank God for him everyday. I truly have a new lease on life because of his expertice and comittment to his obvious ‘calling’ in this life! Dr. Choi is an amazing surgeon and doctor! I had a severely herniated disc at my L5:S1. Simple things like sitting, bending, and even sometimes walking were way too painful for me to do. However, after having a microdiscectomy performed by Dr. Choi I was good as new. However, it wasn’t just the surgery that impressed me about Dr. Choi, he also has the nicest staff. From the ladies at the front desk to Mike everyone was unbelievably helpful and caring. I would recommend Dr. Choi to anyone. I went to Dr William Choi after seeing many other specialist who all of them did not want to even try to work on my back. From the moment I first walked in the door the very first time at Dr choi’s office. I was treated with kindness warmth and respect. from the minute dr Choi walked in and meet me, He said with out a doubt that he could fix my back and have me back to a full life with total self confidence in himself ( which I really liked ) none of the other specialist had any real confidence in what they where even doing. He took me into surgery him and his team and put to rest all my fears about surgery and went ahead and did the surgery!!! Now afterward they work with you for 90 days and this is where they really show they care I got to meet with Meagen every single week and she helped me put aside my fears and concerns and helped me to understand what was going on with my recovery every single week! I have never been treated with such respect kindness and confidence as I have been with Dr Choi and his team I would recommend him to any one and have so on 3 separate times since I had surgery. this is the best dr I have ever had to deal with!!!!! him and his staff !!!!! I cannot say enough nice and positive things about this Dr and his staff!!! If I ever had to go back and had any other kind of surgery I would not even look any where else!!!! thank you to Dr Choi, Megan and the entire staff you have given me back my life !!!!!!! After twenty years of back /leg pain and anti inflammatory drugs, and knowing there was serious surgery in my future… I am most fortunate that Dr. Choi was recommended to me. With a glance at the MRI it was obvious to the doctor what corrective action was indicated; and it was obvious to me, due to the time and attention Dr. Choi spent in educating, explaining and addressing any concerns I expressed, that I had found the Neuro-wizard Who could competently preform the three level fusion required to halt the degradation of my spine- L3 to S1. I was a mess. Blown discs,nerve pain,slipping vertebrae and bone spurs in number and magnitude that made me wonder how I lived with it for so long. Now, I don’t even need an aspirin. For this man’s skill, the highest admiration and respect; with a gratitude that runs deeper than my sciatica used to. The words “Thank you” fall far short Dr. Megan, you are the perfect compliment to Dr’ Choi’s practice. Thank you for all your help! Dear Dr Choi, Just a short thank, inadequate as it may be, for your specialized expertise, nimble hands, positive words of explanation and encouragement, upbeat personality, calmness, and yes ever spirituality you all displayed which put me at ease and gave my confidence in the at hand. My husband and I well forever be grateful to you all. Dr Choi, I feel blessed to have you as my surgeon. My life is changing (for the better! I am amazed at the intricacies of what you do with the humility that you hold within your care. Also I really appreciate that if I had a concern, when appropriate you had a test done to find what may be happening with the pain I experienced. I felt honored and respected. It was indeed a fortunate day for me when I discovered Dr. William Choi. I was suffering from lower back pain and already had previous surgeries which had offered no relief. Dr. Choi directed me to alternate solutions for my problem in order to avoid unnecessary surgery. when those alternatives did not offer my any permanent relief, he scheduled surgery. He is a very talented, kind, considerate doctor offering long term recovery methods and watching recovery very closely. I am grateful to have had Dr. Choi as my neurosurgeon and would recommend him to anyone. Thank You, Peggy. I suffered from severe headaches for more than a year. After seeing numerous physicians and being treated for migraines, depression, etc. I made an appointment to see Dr. Choi, whom my primary care physician here in Kansas referred me to. After some additional tests, surgery was scheduled almost immediately. I no longer suffer from the headaches and continue to improve daily after repair of fractured vertebraes and damaged ligaments. I would highly recommend Dr. Choi. I couldn’t have asked for more professional care and the treatment I received from his office staff was top notch. I would highly recommend Dr. Choi for any type of neurosurgery. Cervical spinal fusion is serious business. Especially when you’ve learned it’s being prescribed for you. I’m a healthy 59- year old male who enjoys skiing, fly-fishing, road biking and many other activities. So when I was told by several very highly qualified neuro-surgeons that I definitely needed fusion surgery, like many of you, I was nervous and apprehensive to say the least. Would I be better off suffering through the pain, and the risks involved with my severe stenosis? Or should I sign-up for the surgery? After my first consultation with Dr. Choi, I knew my answer. Although he explained the risks, I knew I was going to be better off after my surgery than before. This was a three level fusion by the way. My surgery couldn’t have gone more smoothly. Dr. Choi and his entire team as well as the staff at SkyRidge took great care with me. It’s now about 10 weeks since I had my surgery. It’s a relief to know I’m no longer high risk. I?m getting stronger every day. No complications. In fact, this last weekend, I felt good enough to fly-fish, so I did and even caught 5 fish. And my scar would make a skilled plastic surgeon envious. I highly recommend Dr. Choi to anyone who needs the kind of surgery I had. Thank you Dr. Choi and all the very dedicated people who work with you. My son suffered a gunshot wound to the head and he is alive today, thanks to Dr. Choi. It has been nearly 1 year since my surgery and I can truly say that I have never had any pain. It is wonderful to have my life back. Dr. Choi and all his assistants were absolutely wonderful. My dermatologist had a difficult time finding my scar until I pointed out where the surgery was. I would strongly recommend anyone having back pain and or needing back surgery to consult Dr. Choi. The staff at Sky Ridge Hospital was also just the best and made my stay so pleasant. Thank you very much to everyone. Mere words cannot express the depth of gratitude I fell toward both of you. I thank god for bringing two of the finest neurosurgeons to operate on me. My recovery is going remarkably well. Thank you for your tender care and gentle concern. May our lord continue to bless you in you area of expertise. You have now operated twice on me. The first was a C6&C7 fusion. That operation was a success. The second surgery was a L5-S1 fusion. Another successful operation. I am able to live my life fully and without pain because of your tremendous medical skills. Hopefully, there will be no need to meet again for more surgeries. Dr. Choi, I wish you a life of happiness. Namaste. I had a herniated disk that caused intolerable sciatic pain. Immediately following the operation by Dr. Choi, my pain disappeared. I would recommend Dr. Choi without reservation. I suffered from significant/steadily increasing level of lower back pain and numbness in both legs for almost seven years. During that time period I tried, chiropractic, massage therapy, physical therapy, acupuncture and cortisone therapy. Once I made a decision to proceed with surgery, my wife and I interviewed four surgeons, two orthopedic and two neurosurgeons. Dr. Choi was the last surgeon that we interviewed and clearly more experienced and knowledgeable than the other doctors. My wife and I made an immediate decision to proceed with Dr. Choi and the surgery was scheduled for mid June of 2007. I awoke from the surgery free of the chronic pain that I suffered with over the years. I am nine weeks past the surgery and I continue to be pain free and gaining strength every day. Thank you Dr. Choi, you have had incredible positive impact on the quality of my life and all of the people around me. You and your staff, and the staff at Skyridge exceeded my expectations. Your patient for life, Duane. You performed a C4-5 and C5-6 discectomy and fusion on me on April 4. I can’t thank you and your staff enough for your compassionate, professional care. At the time I was at risk for a serious spinal cord injury and I experienced numbness and tingling in my left arm and hand. That problem is virtually nonexistent, and, as you predicted, continues to improve, and my neck is greatly improved over its pre-surgery condition and continues to improve every day. My husband and I think you are wonderful and appreciate so much your tremendous expertise and the undivided attention you gave to me and my problem. We have recommended you to our family physician and would not hesitate to recommend you to anyone needing spinal surgery. Thank you so much. I was very apprehensive about having surgery to repair a herniated disc. After a period of pain, I was ready to do anything to relieve it. I am now sorry to have waited so long to contact Dr. Choi. I appreciated his quick diagnosis and his skills and expertise at correcting my problem. Thank you, Dr. Choi. It has been a year since my back surgery and I wanted you to know how well I am doing. Although, I seam to be more tired at the end of the day I am doing everything that I expect my exercise class to do. Thanks to you I have no back or leg pain and I am very grateful. May you be blessed with everything you need to continue being a great surgeon. With heartfelt appreciation. Best care I have received for an injury that has bothered me for 30 years. Dr. Choi handled my case with honesty and a truly sincere attitude. The care I received from his staff before, during, and after my surgery was incredible. Thank you Dr. Choi and the Neurosurgery Associates staff for my exceptional care. Thank you Dr. Choi for giving me my hope back. I can already feel the difference and know in a short time I’ll feel like a new person. You’re the greatest and your staff is totally awesome and caring. Again, Thank you. After two years of dealing with back pain, physical therapy and three rounds of steroid injections a friend recommended Dr. Choi. My friend had an issue with a cervical vertebra and after the surgery performed by Dr. Choi, she felt younger and had more energy upon her complete recovery. With that as a testimonial, I contacted Dr. Choi’s office and made an appointment, was greatly impressed with his bedside manner, confidence and support staff. Several months later I had him perform a Microdisectomy on my L4-L5 ruptured disc. The surgery, my first, and recover was painless and easy while following the post-op instructions to the letter. The pain is gone, I feel like I had been blessed with a miracle cure and the only thing I have to show for this experience is a small no-never-mine scar. I am most grateful to Dr. Choi and am writing this testimonial as a tribute to his surgical skills and the quality of his care. I am a 39 year old man that underwent a microdiscectomy in late August with Dr. Choi as the surgeon. As a very active adult and law enforcement officer, I was very apprehensive about having my spine operated on. Long story short, I had the procedure and I am doing fantastic. I am a little more than three months out and I have no, repeat no, problems with my right leg anymore. The procedure was not very painful at all, and the discomfort was minimal (I have heard plenty of horror stories from people having back/spine surgeries), and was by far the easiest of the 5 different surgeries I have had on various injuries (which include knee, shoulder, arm) I was having severe neurological problems, pain, weakness, bladder, you name it, and they are ALL gone. I am back to being active and was back to working full duty in no time with no symptoms. Dr. Choi, his nurses (Megan especially), and all of the staff at SkyRidge were absolutely wonderful. Thank you so much, and God bless all of you. Dr. Choi has given me a true gift — quality of life. After suffering chronic back pain for 7 years, I am totally pain free! 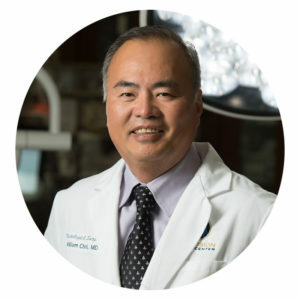 Dr. Choi is a very gifted surgeon who uses state of the art procedures. Communication is a priority for him; he spent time answering all of my questions before surgery, during my hospital stay, and in a follow-up appointment. His staff is very knowledgeable and congenial as well. I highly recommend him! I am 47 and had severe neck pain for the last 10 years.. Physical therapy, accupuncture, chiropractor, you name it I had it! Finally I asked my physician what my next step was, she said continue taking meds and live with it or have surgery. I was expecting my first grandchild in Sept and was having numbness in my arms and fingers. I work with a physician and could not feel the tubes or the veins of the patients who I was drawing their blood, I was not about to take the chance of dropping my grand baby! I went to see Dr Choi in August and we decided that I would have a fusion from C4-C7, I was terrified, this is my neck we are dealing with!!! He WAS AWESOME!!! I wish I would have done it sooner! I am so happy with the outcome. Six weeks in a hard neck brace was a piece of cake compared to the pain I had before! Now I can hold that beautiful little girl and work with just about no pain. (Still a little stiffness but have complete range of motion!) I have referred him to numerous patients who have someone they know with the same problems!!! I am sure they will be as satisfied as I am! Last September I visited you after 18 months of unending, non-stop back pain. You told me I needed a decompression and fusion in the L4-5 region. You promised 90% recovery but I was dubious since nothing else had worked. In October you operated on me. When I woke from surgery I knew immediately the pain was gone. At the end of January my husband and I backpacked and bussed around Costa Rica and Panama. You have given me my life back. I cannot tell you how grateful I am. I am 54 and have so much life yet to live. Thank You. You’re my hero. Exceptional professional care. Accessible. Thorough. Thoughtful and skilled. Not in a rush to cut. He is methodical and provided me with interventions I needed to recovery. We are thankful for his skill set as a top neurosurgeon. Dr. Choi was highly recommended to me from Mike Miller, NP. I spent over a year trying everything go get rid of numbness in my right leg. I was walking with a cane. Dr. Choi fused L3-L5 on February 23. A day after surgery I was walking with no pain. I have had no pain or numbness since. I am back to playing and coaching tennis, even at 66. My wife says she has a new husband. I have been blessed by regaining my health. Thank you Dr. Choi! Dr. Choi and staff, I wanted to thank you for all the time you gave me this past weekend while you were moving your office. Your kindness and attention to my situation went above and beyond on extremely short notice and I am grateful to you all. Good luck in your new space!